I get that, yet, another rant about the air gun issue/non-issue may seem like beating that proverbial dead horse, but some new information has come to light the past couple of days that make the rants about so-called faulty pit guns look like a bunch of “hooey” (I’m sure that’s a technical term), and supporting the case that there is no real issue. Nothing to be seen here; move along, folks. In a recent blog post here on AutoRacingDaily.com, I did an about face, admitting that I was jumping on the bandwagon of there not being a real pit-gun issue after being on that bandwagon of something needs to be done about these seemingly faulty guns at the beginning of the season. To support my change in position, I pointed out that the complaining drivers/teams were the ones previously using faster guns and repeated an already-mentioned suggestion that these teams just weren’t used to using slower guns, yet. And, as a result, they were off-rhythm with the newer, slower air guns. Now, it’s looking like those most vocal about “faulty” pit guns have pie on their faces, or at least they should. Why? NASCAR has made a mandate ahead of Sunday’s Geico 500 at Talladega (Ala.) Superspeedway that teams use only nitrogen to power their airguns. Nitrogen — the gas already recommended by NASCAR and pit-gun manufacturer, Paoli. What?!? Teams weren’t using their mandated air guns according to manufacturer recommendations? Nope. Prior to 2018, the year of the mandated Paoli air gun, teams were using nitrogen to power their air guns, and most have been this year. But guess who decided to use unrecommended helium instead? According to Dave Moody, host of “SiriusXM Speedway” on SiriusXM NASCAR Radio, the very teams who decided to throw the owner’s manual out the window and do their own thing — ahem, using unrecommended helium in place of the recommended nitrogen — are the teams of the most vocal complainers of the so-called “faulty” air guns. So, the air guns don’t work when you don’t use them properly? Hmmm, imagine that. The guilty parties forsook nitrogen for helium, reportedly, because the helium increased the rpm turned by the air guns by 30 percent. Here’s the rub: they also increased the likelihood of pit-gun malfunctions. Translation: these teams were causing their own pit guns to malfunction. 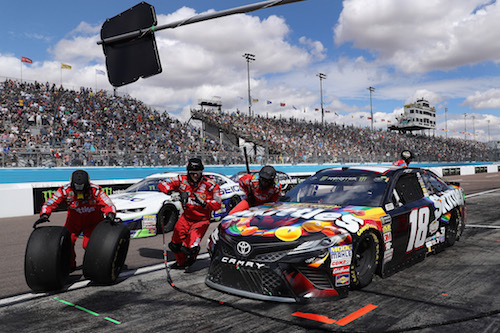 I’m wondering if a couple of the most vocal critics of the air guns — I’m talking to you, Denny Hamlin and Kevin Harvick — knew their teams were causing the malfunctions they were complaining about. I hope not. Even so, I’m wondering if they’re thinking about how foolish they appear now.